PEEM is a valid and reliable measure of Parent Empowerment and Efficacy. It uses an engaging on-line medium to help parents and family support providers consider family strengths alongside the challenges of parenthood. PEEM uses a strengths-based approach to measure parent functioning. It focuses on caregivers’ sense of control or capacity to engage confidently with the challenges of being a parent. The PEEM places parents at the centre of their own future, encouraging them to identify their existing parenting strengths, and any influences within their environment that may help or hinder their capacity to achieve their parenting goals. The PEEM is designed for use with parents or carers of children of kindergarten and primary school age. The measure is short and practical. It has twenty positively worded items that relate to personal and child wellbeing, coping skills, relationship building, and communication. The PEEM has many uses. It helps parents and professionals work together to strengthen parents’ efficacy in their role as caregiver. It can also be used to support comprehensive evaluation within parent support programs and community organisations. In particular, it can help agencies to review the effects of the resources and services they have delivered for individual parents, groups of parents, and families within the community more broadly. The PEEM is delivered using an on-line format called PARENT’S VOICE, although a hard-copy paper version is also available. Be sure to read out Frequently Asked Questions section below. + What Is the PEEM? The Parent Empowerment and Efficacy Measure is a strengths-based tool for understanding caregivers’ sense of confidence in their parenting role. It uses a 10-point rating scale to collect responses to 20 positively worded items. It yields a Total Efficacy Score and two subscale scores (Efficacy To Parent; and Efficacy to Connect). + Is it a valid and reliable measure? Yes: The Parent Empowerment and Efficacy Measure was developed as part of a collaboration between researchers at Griffith University and practitioners at the Pathways Family Support service. Family support was a major component of the 10-year Pathways to Prevention Project that brought together partners from the university, government, non-government, and school sectors, and operated in a community where many families experienced high levels of social and economic stress. Follow this link http://dx.doi.org/10.1080/0312407X.2014.902980 to see an article published in the journal Australian Social Work that describes the development, validation and psychometric properties of the PEEM measurement tool. The PEEM is for use with parents / carers of pre-school and primary-school-aged children. The PEEM is a short and practical measure (20 items) that can be completed using either a paper and pencil form, or an online version called A Parent’s Voice. Attractive audio-visual format provides an engaging experience. Audio features alleviate discomfort for respondents who struggle with reading. A Parent’s Voice makes few demands on literacy skills since voice overs allow respondents to listen to the questions presented in spoken form. Automatic score calculation: The system applies a failsafe algorithm to generate a Total Efficacy Score and 2 Subscale Scores from the responses parents provide to the 20 questions. This saves practitioner time and eliminates error. Users can download the results for individual, selected groups, or all of their clients in a spreadsheet format that makes data management and analysis for the purpose of program planning and program review easy. + Who can use it? 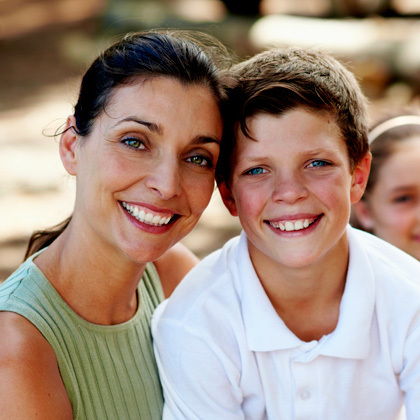 The PEEM was designed for use by practitioners in family support services. It can help parents and professionals as they work together to strengthen caregivers’ confidence with parenting. It is also a useful tool for program or service evaluation. + How long does it take to administer? With only 20 questions, the PEEM scale itself does not take long to complete. However, thoughtful responses should be encouraged by emphasising that there is no need to rush and by reassuring respondents that the more considered and sincere their answers, the more meaningful and productive the journey of support and empowerment that you take together can be. + Does it work in field settings? Yes – Data can be collected with A Parents Voice in field settings using your organisation’s portable devices (ipads or laptops) as long as an internet connection is available. If not – you can use the paper form and transfer the responses to your account’s database manually through a feature on the Parent’s Voice User Dashboard. + How do I access Parent’s Voice? Cost is based on the size of your organisation and potential number of participants to be included. + How do I access my results? The responses are saved to your secure account. The dashboard functions enable you to view responses online, or download your data in spreadsheet format. + Can I get help if I need it? Yes. Technical support for registered Parent’s Voice account holders is provided via an online support function built into their User Dashboard. WHY – The PEEM can help parents and professionals as they work together to strengthen caregivers’ confidence with parenting. It is a useful tool for program planning and service evaluation.